Good evening, friends! Olive Oyl making a special appearance as I’ve made an incredible discovery! 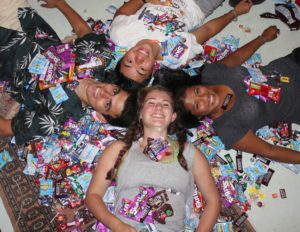 Sometime in the middle of the night…the AWACs appeared…as did a giant mountain of candy. Who knows what these pounds and pounds of sugary goodness could possibly be used for? Is that the sound of a plane engine whirring I hear?